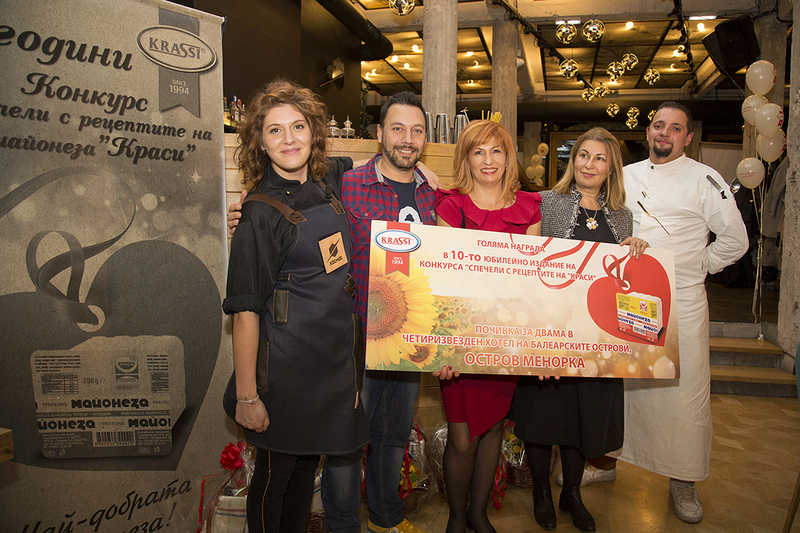 The 10th edition of the traditional culinary competition of “Krassi” mayonnaise gathered all the winners over the years. Their recipes prepared by the latest MasterChef of Bulgaria Bozhana Katsarova competed in the culinary battle of the best. Eminent cooks were assigned the difficult task to choose one recipe whose author would win a trip for two to the Balearic Islands, more precisely to the Island of Menorca, from where, in its largest city of Maó-Mahón, the exquisite sauce known nowadays as mayonnaise, originated. The strict and fair selection committee of the culinary competition included the most multi-functional cook of Bulgaria – a reality star and TV and radio presenter Leo Bianchi, the world famous culinary expert Georgi Boykovski and the Manager of Krassi Mayonnaise Factory Daniela Avdzhieva. They decided to award the prize to Vesela Stoitsev for her Pumpkin Mousse Parfait and “Krassi”. More than 150,000 recipes have been received over the ten years of the competition, among them recipes for salads, soups, different types of bread, main dishes, cakes, various types of banitsa, sweets and salted baked goods. We thank to all our fans who, with perseverance and loyalty, sent delicious recipes over all these years and surprised us with their endless imagination. For the past 10 years loyal fans of “Krassi” have been awarded over 500 prizes among which home appliances, tablets, cameras, smart watches, excursions to Egypt, trips for two to Italy, Turkey and Egypt, spa weekends and kitchen sets. Guests of the culinary competition enjoyed the special participation of Bozhana Katsarova who cooked the finalists’ recipes and also refereed a game where the guests of the event had to guess the ingredients of a randomly chosen dish. Sarah Suzette Namba, the Filipino singer who impressed the music specialists with the appearance she made at The Voice of Bulgaria, entertained all those present at the event. For more than 20 years now Krassi Mayonnaise Factory has been a leader on the Bulgarian market. A number of awards accompany the successful business development of this popular brand. The Superbrands global organization awarded “Krassi” its title as an exceptional brand which stands out and dominates. For a third consecutive year “Krassi” mayonnaise is a “Favourite Brand” of the Bulgarian consumers. The high quality of the product is a core value of the brand. It is constantly followed with care and attention by each one of the company employees. To offer a product of unchangeable and constant high quality is of utmost importance for the brand and for all those who work for it.